Lucas Gradinger was a two-time All-American at Torrey Pines and was named the U.S. Lacrosse Western Region Player of the Year in 2013. 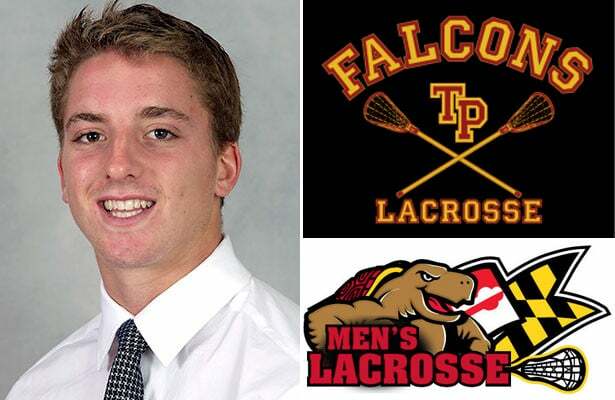 Now entering his third season at the University of Maryland, Gradinger will be returning to Southern California in March, when the Terps face Notre Dame in the Pacific Coast Shootout at Orange Coast College. Maryland enters the season ranked No. 4 in the Inside Lacrosse 2016 Face Off Yearbook Top 20. Notre Dame, though, is ranked No. 1. For Lucas Gradinger, the game is a second opportunity to play in his home state. He missed the first due to injury. After appearing in five games and scoring his first collegiate goal as a freshman in 2014, Gradinger was hurt in the second game of his sophomore season last spring. He missed Maryland’s 10-8 win over North Carolina in last year’s PCS. He is healthy again this year and is looking forward to playing in front of a friendly home crowd. Tickets for the March 5 PCS are available here. What helped you get to where you are today? Hard work. I put in a lot of extra time into my game growing up. I think that’s something you have to enjoy to take your game where you want it to go. How has it been playing high-level Division I lacrosse at Maryland? It’s incredible. It’s really a dream come true and something I really try not to take for granted. Lacrosse doesn’t get any bigger than at The University of Maryland and in this state in general. People are lacrosse crazy here, and this program is full of so much history. To be a part of this program and the family that goes along with that is pretty special. How is it different than playing in San Diego, at the high school level? It’s a whole different game. Physically, everyone is skilled, bigger, faster, stronger, etc., but I’d say mentally the game is the most different. Playing at this level we break every aspect of the game down far beyond what I ever could have imagined coming out of high school. You need to have an extremely high lacrosse IQ to play at this level. Talent can only take you so far, but to be successful here you need to be just as sharp mentally. You need to have an extremely high lacrosse IQ to play at this level. Talent can only take you so far, but to be successful here you need to be just as sharp mentally. What are your thought on how Maryland has ended its last couple of seasons since you’ve been there? It’s obviously been disappointing. We’ve had a couple awesome seasons and have won a lot of games. To get that far in my first two years and come up short, it’s very frustrating. I try to look at it as a positive. The standard was set a long time before I got to Maryland. I’m proud of how we’ve reached that standard and often exceeded it. I’ve had some amazing experiences along the way, but unfortunately we’ve come up a little bit shorter than we’d like. How do you feel about this upcoming season and your team’s chances of finally winning a national title? Extremely excited about this season. Personally, I had a season-ending injury in the second game of the season last year against Yale, so I’m itching to get back on the field. As a team, we feel great about the upcoming year and our potential. Every year here the goal is the same, and that’s to win a national title. That doesn’t change with this group — we will take it one game at a time. Are you excited to play in the Pacific Coast Shootout, a major homecoming for you? I’m absolutely chomping at the bit. Like I said, I was injured and unable to play at last year’s event, and it was tough to swallow. The chance to play in front of so many friends and family will be an awesome experience. The atmosphere last year was great, and I know this year will be the same. It’s such a cool opportunity to bring my teammates back home and show them what the West Coast is all about. I can’t wait to showcase myself along with my teammates and show people what Maryland lacrosse is all about. When I was younger, events like this didn’t exist. I think there’s something to be said for watching this level of lacrosse in person, so it’s great to be able to provide that for kids on the West Coast and the West Coast lacrosse community in general. It’s such a cool opportunity to bring my teammates back home and show them what the West Coast is all about. I can’t wait to showcase myself along with my teammates and show people what Maryland lacrosse is all about. How do you think Maryland stacks up against Notre Dame, recently named preseason No. 1? Notre Dame is always tough. In terms of the last 5 or 10 years I think it’s hard to find too many teams that have had the same level of success as the two of us. We had some great battles with them my freshman year in our last year in the Atlantic Coast Conference. They are a great program, and I can’t think of much better of a matchup for the people out in SoCal to see. Are you hoping to inspire some young West Coasters to follow in your footsteps and play D-I lacrosse? Definitely. I know that as a kid I always looked up to older guys as role models and for inspiration. It’s awesome to give back to the West Coast lacrosse community, and I love working with the kids as much as possible. I have tremendous pride in where I come from. I wouldn’t want to be from anywhere else and I hope young kids are proud of that too. I hope they can look at me like I used to look at the guys that came before me and realize that they can be afforded the same opportunities if they work hard. Do you think this event helps bridge the gap between East and West Coast? Yes I do, I think that watching a game like this in person is drastically different than on TV, and that aspect of this event is very valuable. Not only are people from the West Coast seeing how the game is played at the highest level but the many east coasters on the two teams, coaches, etc., are seeing how much the game is growing back home and how excited everyone is about the sport. How long until West Coast lacrosse overtakes East Coast? I’ll give it 10 years. Or at least until we get a few college teams up and running. Who wouldn’t want to go to school in Southern California?